This weekend I visited the lovely Manhattan Beach to watch the 6-Man and 6-Woman Beach Volleyball Tournament, which pretty much is a tailgating party on sand with volleyball players competing in crazy Halloween-like costumes. I've never seen so many people on the beach, it was a sea of tents, sponsor signage and volleyball courts. My girlfriends were playing on the team, Risky Business, which consisted of a costume of pink boy shorts and a man's button up white shirt. 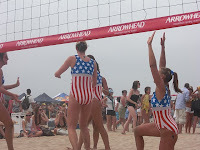 It was very cute, although I really loved the team that was dressed in nun habits and black bikinis, every time they would jump up to spike the ball, their habit would flap in the wind like a mighty cape or something. I only watched Risky Business play their final game, where they played a bunch of girls in 80s like American flag full piece bathing suits, which was fine but every time they'd score a point they'd go into gymnastic poses and do flips. It was rather annoying, in fact I found it so ridiculous that I took a photo of them too just for your viewing pleasure. I played some Volleyball myself this weekend, but on an amateur level. For once I didn't do too bad, it seems the more I play the less embarrassing I get at least. I am too short to play Volleyball! man that tourney looks like so much fun. i was going to go, but alas the craziness deterred me a bit. I love the american flag suits!